The Melbourne International Coffee Expo (MICE) is undoubtedly the first big event on the coffee calendar for the year. Just as we get over Christmas, New Year, and the back-to-work honeymoon phase, the largest dedicated coffee event in the southern hemisphere hits us from all angles. It’s likely to hear ABC radio announcer Jon Faine get somewhat excited over the hysteria, see MICE street posters plastered on station alleyways, and watch promotional material clog your Facebook feed. Chances are most die-hard coffee consumers already know about it and have booked their ticket, but if they don’t – baristas, it’s your duty to educate them and uphold Melbourne’s status for having one of the most progressive and discerning café scenes. Plain and simple, this is going to be a huge drawcard. 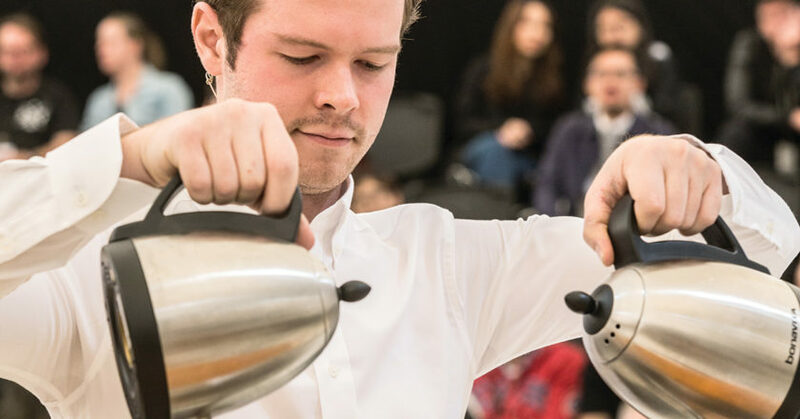 Why not watch the top baristas in the country compete in the Australian Specialty Coffee Association national latte art, brewers cup, cup tasters, barista, and roasting championship? If you’ve never seen a competition before, you’re in for a real treat. There are judges, rules, an emcee, a grandstand, and people taking coffee very, very seriously. It’s an atmosphere not to be missed. Better yet, if you have a friend or colleague competing, then show your appreciation with hand-made face masks, signs of encouragement, and team t-shirts. If you’ve heard of cupping before but always hesitated to learn more or dive into a session, then it’s time to break the ice – or crust, in this case. A visit to the dedicated Cupping Room will introduce you to award-winning coffees, such as Best of Panama award-winning coffees. If you don’t know what this means, don’t worry. Its even more reason to visit the Cupping Room and find out. If you’re an experienced cupper, then go for the tasting pleasure. The MICE Product Innovation Awards will return in 2018. A panel of judges will award their top product or service that’s made an impact in the industry over the past year, but there’s also the People’s Choice Award to be judged by MICE visitors – that’s you. You have the power to vote for your favourite product at MICE and help give a new and inventive product a leg-up in the industry. Consumers: make your vote count. Are you a barista up for a good time, for a good cause? MICE2018 will host Shave the Barista, a fundraiser to raise money for Charity Partner StreetSmart. We’re calling for baristas, male and female, to shave their locks and beards. This is your chance to meet some of the stars of the coffee world. If you’ve heard about “champion baristas”, then this is your chance to meet, greet, and snap selfies with your coffee idols – former and current Australian and World Barista Champions. For the second year, MICE will bring together some of the biggest names in the competition scene for the ultimate latte art smackdown. If last year’s event was anything to go by, expect the unexpected and never believe the baristas when they say they haven’t been practicing for this “casual” competition – they totally have. A trip down Origin Alley or to the many roaster stands will expose you to some of the world’s most unique and delicious coffees, and if you’re lucky you’ll meet a producer. Talk with the exhibitors from India, Vietnam, Costa Rica, Myanmar, Honduras, Brazil, and Guatemala, and meet the people that work so tirelessly to deliver the product we celebrate and consume every day. If you’re new to the world of coffee or want to sharpen your skills to impress your friends, then take your visit to MICE as an educational opportunity. Use each coffee as an experience to test your palate and see what flavour notes you can pick. Maybe you want to know how that gold liquid came to be in your cup or where it came from. Ask the many baristas on hand. Nothing gets them more excited than inquisitive customers or sharing the message of crop to cup. This is an industry about knowledge sharing, and share we must if the profile of specialty coffee is to increase around the country. If your education level is high, consider one of the many Specialty Coffee Association training courses available. MICE presents a collective sound of beans filling hoppers, milk aerating in jugs, music playing on the competition stage and emcees bellowing competitor names. It’s an atmospheric buzz that needs to be experienced. As you take a walk around the show floor, observe the people you see. Nine times out of 10 you’ll see smiling faces. The coffee industry celebrates its proud place in Australia’s culture, and those a part of it are colleagues, new connections, and mostly, friends.